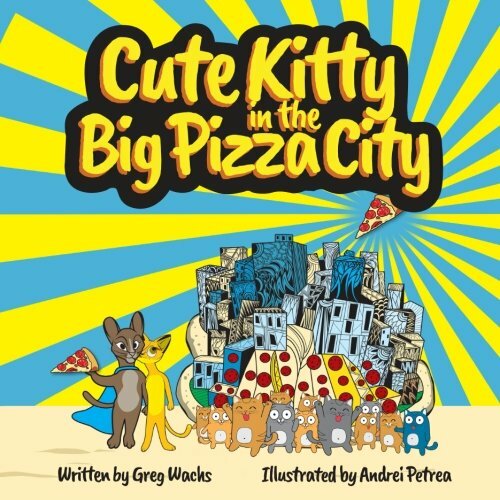 For children ages 5 to 10 and written in clever rhyme, Cute Kitty In The Big Pizza City is the story of a little yellow kitty and a superhero tomcat who battle a wicked witch and make a city-sized pizza. The witch turns up the heat and casts a spell to make cheese fall from the sky, but Cute Kitty and her boyfriend Danny win the day when they add tomato sauce, sausage and mushrooms and invite all the cats in town to share a giant pizza. Wachs tapped Romanian illustrator Andrei Petrea to create the colorful, intricate geometric designs of the city, and bring life to the friendly animal characters and the dastardly snaggletooth witch. A matching pocdcast is coming soon.